Today's typical windows and fixed glass are designed to insulate against heat loss, block excessive solar energy, reduce air infiltration, control fading damage from ultraviolet radiation and reduce noise transmission. Unfortunately, such otherwise sophisticated fenestration systems are not capable of effectively resisting the often powerful and devastating force of windblown debris, earthquakes, explosions, and even security threats. Subjected to stress, existing glass often breaks into lethal shards that may be ejected from window frames, endangering facility occupants. If your facility contains unprotected window glass at or near floor level, glass observation rooms, glass doors, or other glass installations, both residents and staff are at risk of glass-related injuries and possible death. Most injury from glass occurs when people accidentally walk into a glass door or window, resulting in a trauma to the knee and upper leg from falling glass. The next most likely area of injury is to the head, neck and shoulders. These injuries can lead to severe damage to tendons and loss of limb or limb function. Pieces of broken glass can be as deadly and dangerous as a knife. Hurricane-force winds can hurl an object through a window, causing glass shards to strike occupants. An explosion creates a shock wave that may atomize glass particles, which can be inhaled by building occupants and result in death. Some explosions are so powerful they can break glass in buildings blocks away, causing property damage that would not have occurred had the glass remained in its frame. In this Bomb Blast video you can see how the film holds the glass together instead of shattering all over your home. While laminated glass may be the logical choice in newly constructed facilities, security window film is a cost-effective alternative in existing facilities restricted by limited budgets. Security window film is made up of either optically clear, tinted, or reflective layers of polyester film applied to the interior surface of existing glass window. Unfortunately, the benefits and relatively low cost of security film are not widely known. 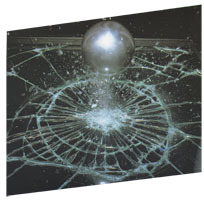 Glass security film can improve the ability of existing glass to mitigate the impact of accidental breakage. A security window film's primary function is to hold glass intact if broken, preventing shards from becoming lethal projectiles or dangerous weapons. Because the security window film stretches without tearing, it can absorb a significant degree of the force of accidental or intentional glass breakage. The impact, when great enough to break the glass, is not enough to shear the film, and the broken glass is held intact by the security window film. Not only are there no injuries, but there is no damage to the building. If the force of impact breaks the glass and shears the film, the glass collapses attached to the security film with minimal damage and injuries. Security window film can be applied to single pane and many types of insulating glass. Applied security window film is available with and without heat-blocking solar control capabilities. Independent test verify that many security window film provide equivalent or, in some cases, superior ability to withstand stress compared with laminated glass.